Please, could you tell me which course l need to pass to retain my ECS certificate and which courses l need to increase that to the ECE Level. I was doing ExtremeEOS Switching & Routing (ECS Level) about 2 years ago (cert still valid). Exper level it's just combination of the specialist level certs, am l right? If I will pass any other cert, let's say advanced routing, my ExtremeEOS Switching & Routing (ECS) will be extended automatically. Is it right? 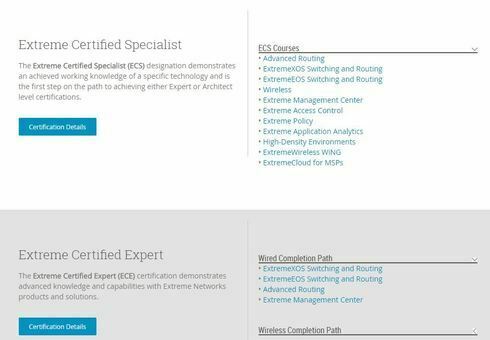 The last question, for Expert wired, do l need both EOS and XOS or it can be just one plus advanced routing and EMC certs. Yes you are right. For the last question, there is a exam named: Switching and Routing Boot Camp (EXOS and EOS), if you pass it, then you get both EOS and XOS. To get ECE (Extreme Certified Expert) Certification, you need to get ECE Wired + ECE Wireless + ECE Networking + ECS Access Control. For example, if you pass Switching and Routing Boot Camp (EXOS and EOS), Advanced Routing, and Extreme Management Center, you will ONLY get ECE Wired, not ECE Certification. If you pass the Advanced Routing it will not extend the ExtremeEOS Switching and Routing or ExtremeXOS Switching and Routing because the materials are different. As Suzanne has mentioned above, the existing certificaions won't be extended automatically as they are different certification each other. In other words, your EOS switching and Routing certification won't be extended automatically even if you passed the ECS wireless as they are different certifications. The only way to extend your EOS switching and routing certification is to re-certify it before expiration. If you passed the exam, then you will get the certification again from the date. Otherwise, nothing but you just failed to get the certification... That's all. Thanks, and it is finally clear. What will happen if I take an exam after the certificate has expired?